This resource shows how progress can be measured, includes key questions to ask, and provides links to more resources. Arts education programs may address several of the state’s eight priority areas, including Access to Courses, Student Achievement, and Student Engagement. The template demonstrates how arts education can meet these priorities by providing potential goals that can be included in a district LCAP. It also suggests metrics to measure whether those goals are being met and provides examples of effective arts programs that can be used to meet those goals. By: California Alliance for Arts Education, Arts for All, Arts for LA. This report provides an overview of the ways in which LCFF funding can be used to improve parent engagement. The report stresses that in order for the LCFF to improve student success, districts must place parent/family engagement at the top of their priority list. The document highlights six indicators that parents, community members, and district leaders can use to determine whether or not a school is fostering meaningful parent engagement. This guide support school districts and parents in the development of family engagement goals and activities as part of their newly required Local Control and Accountability Plans (LCAPs). The guide provides specific goals for each of six accepted family engagement standards, as well as indicators for measuring whether those goals are being met. After-school programs can help to boost student success. This resource provides a rationale detailing why after-school programs are an efficient use of LCFF funds. The report discusses the ways in which after-school programs can advance several of the state’s eight priority areas. In addition, it provides several examples of the ways in which LCFF funding can help support after-school programs. This report provides information detailing how summer learning programs can substantially increase student success, especially for underserved youth. In particular, the report highlights the relationship between summer learning programs and the state’s eight priority areas. Several of these priority areas, such as Student Achievement and Student Engagement, can be met by implementing school site or district wide summer learning programs. This resource provides tools and strategies that groups and individuals can use to advocate for summer learning programs as their school district works through the LCAP planning process. The document includes a brief description of the Local Control Funding Formula, an overview of the LCAP planning timeline that districts are required to follow, and six advocacy activities that correspond to that timeline. For further information on the importance of summer learning programs for student’s academic success see Leveraging Summer for Student Success. This sample LCAP can be used as an example for districts who are looking to include effective summer programming in their LCAP. The sample provides potential goals that relate to summer programs, metrics to measure district’s progress towards achieving those goals, and actions and services to meet those goals. This primer is designed to help communities leverage the LCFF priority-setting process to promote access to high-quality Early Learning and Development (ELD) programs. This document is primarily targeted for community and parent organizers, ELD advocates, local First 5 Commission leaders, and school and civic leaders who are interested in making a compelling case to increase services that benefit children aged 0-5 in their community. Many California students have limited access to the supports necessary to apply for college financial aid, and this lack of support can restrict students’ access to college. In order to address the CCR state priority area, districts can include financial aid programs in their LCAP. This template provides examples of how financial aid initiatives can be written into the LCAP. The template includes goals, metrics, and actions and services that are all focused on providing students access to college financial aid. Under the Student Engagement priority area, California school districts are required to monitor and address chronic student absence. This report details steps that districts can take throughout their LCAP planning process to address this issue. The steps include strategies to gather and analyze data, and engage stakeholders who can help districts design programs to combat chronic absence. In addition, the report highlights the ways in which professional development can be used to help reduce chronic absence. Student Engagement is measured using school dropout rates, chronic absenteeism, and student attendance. This self-assessment worksheet allows districts to evaluate their approach towards addressing chronic absence, so that they can identify the strengths and weaknesses in their programs focused on reducing chronic absenteeism. Information gleaned through this assessment could be helpful for districts who are developing or improving programs designed to address chronic student absence. This fact-sheet establishes the link between student health and student attendance, absenteeism, and school dropout. In addition, the fact-sheet provides examples of how school health services help to improve Student Engagement, and the ways in which districts can enhance their existing health services in order to increase student engagement. This sample LCAP provides information concerning truancy and chronic absence that could be helpful in guiding districts as they develop their LCAP. The sample outlines aligned goals, metrics, and actions and services that are centered on increasing attendance and reducing instances of chronic absence. Districts must describe the ways in which they plan on measuring school climate in their LCAP. The SBE requires districts to report suspension and expulsions rates as a measure of school climate, however, districts are required to submit other measures of school climate in addition to those two indicators. This resource provides information on existing surveys that districts can use to gather school climate data. The resource also details how that data can be analyzed to inform school and district decisions concerning school climate. This document highlights the ways in which the California School Climate, Health, and Learning Survey System (Cal – SCHLS) can aid school districts through the LCAP planning process. By administering this survey, districts can gain further insight into their student’s needs. The document details how districts can use these insights to develop goals and actions and services that address the state’s eight priority areas. Many factors contribute to suspension and expulsion rates in schools. This fact sheet discusses the link between student health and expulsion and suspension rates. In addition, the fact sheet details the ways in which student health programs can be included in districts’ LCAP in order to decrease expulsion and suspension rates and address the School Climate priority area. Districts can use this template as a guide when addressing the School Climate priority area in their LCAP. The template provides potential goals, metrics to measure whether those goals are being met, and actions and services that could help districts meet those goals. All of the measures suggested in the template are focused on decreasing school suspension and expulsion rates, and improving overall school climate. The Linked Learning approach is focused on integrating college and career readiness practices (CCR) into every student’s academic experience. Preparing students for college and careers is one of the priority areas that the State Board of Education requires districts to address in their LCAPs. Beyond the CCR priority area, this report highlights the ways in which the Linked Learning pedagogical approach can be employed in district’s LCAP to address the seven remaining state priority areas. Districts are required to explicitly address the needs of their foster youth students in their LCAP. This resources outlines steps that districts can take in order to address these needs. It stresses that in order to effectively improve educational services for foster youth, districts must work to both develop an LCAP that includes foster youth programs and actively work to implement those programs beyond the LCAP planning process. This sample LCAP serves as a resource that districts can use when drafting their LCAP and discussing the ways in which they will address the needs of their foster youth students. The sample includes potential goals that are focused on foster youth, and actions and services that are designed to meet those goals. LCFF was designed to improve the academic success of all students, particularly underserved groups such as foster youth, English language learners, and low-income students. How districts are planning to serve these student groups in relation to the state’s eight priority areas must be included in each district’s LCAP. This document provides an overview of each priority area along with goals, and actions and services focused on expanding educational opportunities for English Language Learners. A crucial priority area that school districts are required to address in their LCAP is the Implementation of Academic Content and Performance Standards. This LCAP template focuses primarily on the ways in which districts can support English Language Development (ELD) instruction that is aligned with the current ELD and Common Core State Standards. The LCAP serves as a comprehensive example of what an integrated CCSS/ELD plan might look like. This document poses questions for districts to consider as they develop their LCAPs. The questions guide districts through the stakeholder engagement, goal-setting, and services planning process, prompting districts to think about students’ needs. By Pivot Learning Partners. The presentation set out steps districts can take at each stage of the LCAP development process to ensure that the plan is geared toward improving student outcomes. By Pivot Learning Partners. 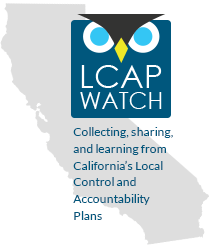 This document provides districts with detailed instructions on how to produce a relevant, well-informed, and transparent LCAP. It also highlights parts of the LCAP process that districts must consider to remain within the spirit and the letter of LCFF. By WestEd. This graphic illustrates the cycle of steps involved in the LCAP process and assists districts in building timelines for its LCAP steps and reevaluations. By WestEd. This online LCAP builder allows district to electronically input their LCAP information and populates the LCAP template with the entered information. This platform allows multiple parties to comment on an LCAP in progress and lets county offices of education review and approve LCAPs directly on the eLCAP website. Control Accountability Plans. Through a step-by-step process, users develop goals that are aligned to metrics, actions, and anticipated costs. The information entered on the tool populates the state’s LCAP template that users can download, edit, and send directly to their county offices of education. This online LCAP platform, developed by the Association of California School Administrators, prompts the user with guiding questions to provide the information that fulfills all of the statutory LCAP requirements. The tool populates the LCAP template with the entered information. This platform also generates a summary report, a comprehensive report, and an executive summary. This website provides tools and processes that can help districts align their resources (people, time, and money) with their student achievement goals. SmarterSchoolSpending.org also connects districts with technical assistance providers and an online community so that there is support at each step of the way. With this introduction and executive summary, Berkeley Unified provides insight into the district’s mission and theory of action. It also provides a clear explanation of the direction the district has chosen to take with its LCAP. This executive summary provides historical and financial context for the LCAP, making the district’s plan clear and digestible. In its executive summary, Fresno Unified provides a helpful overview of its LCAP timeline, district demographics and student outcomes. This executive summary also provides a short-form version of the district’s proposed supplementation and concentration funded actions and services under each of its LCAP goals. Irvine Unified provides a graphically-rich executive summary that has many different kinds of information. The executive summary includes background on LCFF and LCAP, shorted versions of the district’s goals, and expected student outcomes, and demographic information about the district. There is also an overview of the district’s budget, including the amount and type of expenditures anticipated in the corresponding LCAP year. This LCAP summary condenses the most relevant LCAP information into an easy-to-understand overview. Oakland Unified’s LCAP summary opens with a snapshot of detailed, clear budget information that helps the reader connect the LCAP content with the overall budget. The summary goes on to provide summaries of Oakland Unified’s LCAP goals, including the expenditures allocated to meet the goals. The goal sections also list how the district is performing on related outcomes, which are color-coded based on whether the district has met, not met, or exceeded the expected outcomes targets. This graphic distillation of the district’s LCAP catches the reader’s attention while providing relevant background, goals, and actions from the LCAP. Gobo is a graphic design company that has contracted with over 50 California school districts and county offices of education to develop infographics of their LCAPs. The first district LCAP infographic the company created was for Bear Valley Unified – the infographic featured, above. This three-fold flyer provides a community-friendly list of the district’s planned services for the three-year LCAP cycle. This 8-page informational brochure summarizes the district’s LCAP goals and actions. This three-fold, student-designed flyer summarizes the content of the corresponding 8-page brochure. This presentation is intended to provide the Santa Ana community with information on LCFF, LCAP requirements, and the community’s role in the LCAP. The presentation also provides information about the district’s community engagement plan and timeline, as well as guiding questions for community input. San Francisco Unified used this presentation to introduce LCFF and LCAP to its community. It provides helpful background on the changes to school funding laws, relevant district-specific financial data, and general information on the LCAP process and timeline. This presentation provides a summary and description of Los Angeles Unified LCAP, when the superintendent presented the plan to the district’s board in June of 2014. This presentation explains the content of the LCAP in a clear manner. It also walks through the changes made to the revised version of the LCAP as a result of community feedback. The Education Trust–West has developed a webpage that provides tools for district and community leaders can use to increase district budget accessibility. The focus of these tools – including a list of budget engagement best practices, an editable PowerPoint budget presentation, a budget-related webinar, and more – is to support districts in providing clear, understandable budget information as they engage stakeholders in the LCAP process. This document lists Gilroy Unified’s planned supplemental and concentration fund expenditures in an easy-to-read, clear format. This document provides the dollar amount of each expenditure and enough of a description to understand the planned program or service. This document — found at the end of SFUSD’s LCAP — itemizes all of the district’s supplemental and concentration fund expenditures. While the description of these expenditures is minimal compared to the LCAP, it is helpful to see an accounting of the total amount of supplemental and concentration fund expenditures. This document lists all LCFF expenditures, separated by base and supplemental and concentration funds. While not as descriptive as the LCAP, this document increases transparency by providing an exhaustive list of all LCFF expenditures. After hosting over 40 data equity walks across California, The Education Trust–West has created the Data Equity Walk Toolkit, so any organization can host its own data equity walk. A Data Equity Walk is an activity during which community members do a gallery walk of education equity data visualized on charts displayed in an open space. This gives community members an opportunity to observe analyze the data they see and to spark thinking about solutions to the issues surfaced in the data. Community organizations have used Data Equity Walks to ground LCAP stakeholders in relevant district data as part of engaging in the LCAP planning process. This website provides visual displays of data related to the LCFF required metrics. Sharing district data on this website enables LCAP stakeholders to better understand students’ educational needs and provide better-informed feedback. This website provides interactive visualizations of data related to the district’s LCAP. The site includes data on various indicators, for example the latest CAASPP assessment results as well as graduation and dropout rates.